This weekend we had one of our best ski days ever at Castle Mountain, AB. More than 20 cm of fresh powder helped to make this a really memorable road trip! This weekend we had one of our best ski days ever while on a road trip to Castle Mountain, AB. More than 20 cm of fresh powder helped to make this a really memorable road trip! Castle Mountain is tucked away in the South West corner of Alberta, close to the BC border. It is about a 2 hours drive from Fernie. After we’ve finished our CSIA level 1 course this week, everybody on the bus to Castle Mountain was very keen to play in the powder that had been accumulating all week. As we were getting of the bus, a guest services representative announced that there were more than 35 cm of powder at some spots on the mountain. Not even the extremely slow lifts or long lines could damper our enthusiasm. We wanted to get to the top to explore one of the many black and double diamond runs on the mountain, but after riding up the blue lift, we found the red lift still closed. We were still hearing some explosion being set off by the ski patrol to make parts of the mountain safe. So we did a quick run down to the bottom to warm up. This time around we thought we should try the T-bar up, since the line was much shorter, which was a big mistake. The T-bar is very long and steep, and my legs were burning by the time we got to the top. But then we had our first real taste of powder of the morning, skiing some fresh lines down to the red lift, which had since opened. The red lift was an even slower two person’s chair with long lines all day. But the wait was worth it, we skied fresh powder all day. Every time we were going up the slow lifts, I would wish for a faster quad lift, but every time we skied fresh powder I realised the slow lifts keeps the really big crowds away, which allowed us to still make fresh tracks at 1600. The resort has some amazing runs, steep black and double blacks are all over the mountain. My personal favourite was one of the dense tree runs we did on the right hand side boundary of the resort, thigh deep in fluffy fresh snow! It is unfair to really try to compare the day we had in Castle Mountain to the time we have spent in Kimberly or Whitefish. On a powder day like we had, Castle Mountain was the best place in the world to be! Castle Mountain also have ‘the best’ cat skiing in Alberta, but there was no need to get a cat to make fresh tracks on Saturday. There are two lifts servicing the lower parts of the mountain where beginners can ski green and blue runs. There are also a few blues from the top part of the mountain, but you should be a confident intermediate before attempting them. 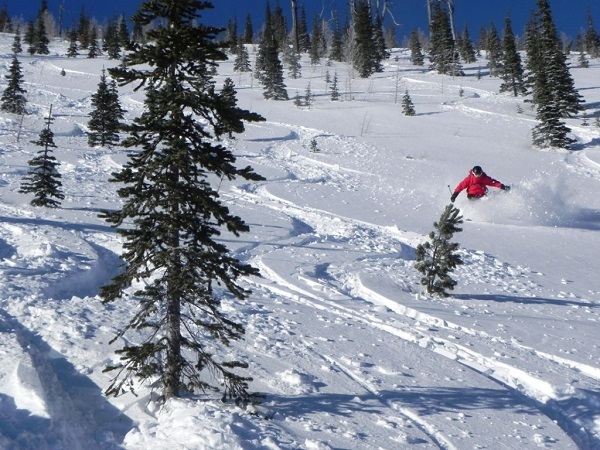 If there is powder around Castle Mountain it is worth the drive to go and have some fun! This entry was posted in Ski Resorts, Sports on 2013/02/27 by Justinus.